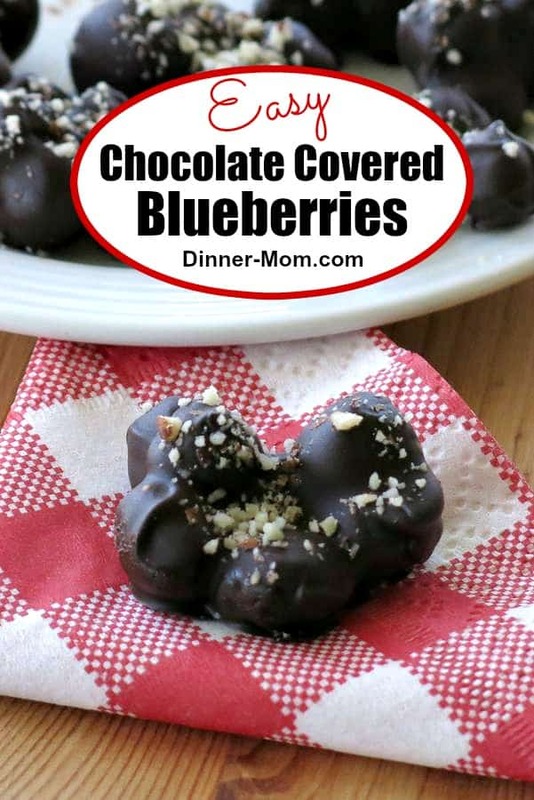 Dark chocolate covered blueberries are dusted with finely chopped almonds in this easy recipe that looks and tastes decadent, but uses healthy ingredients for a clean-eating dessert! OMG. Fruit and chocolate! Is there anything better? Dipping it in Brownie Batter Dessert Hummus is delicious. We also enjoy chocolate dipped clementines atop of Flourless Orange Chocolate Cake. Fresh, juicy clusters of blueberries coated with dark chocolate and topped with finely chopped almonds is another. Each bite bursts with flavor and is pretty healthy as far as treats go…if you don’t eat too many. Portion size is under control in this small batch recipe that yields about 6-7 clusters. It’s perfect for date night! Of course, it’s easy to double or triple it for a larger crowd. Pairing dark chocolate with fruit is a clean-eating dessert favorite. The sugar content is lower than other types of chocolate and it only takes a few small squares for a very satisfying treat. The only downside to this recipe is that you have to wait about 30 minutes while the chocolate blueberry clusters set in the refrigerator. It’s hard. But, it’s totally worth it. Blueberries – wash and thoroughly dry before using so the chocolate will easily adhere to the berries. Almonds – Pulse about 1/4 cup of almonds in a mini food chopper to get a powdery dust. Keep the unused portion in the refrigerator for another batch or for another use, like sprinkling on yogurt or oatmeal. Dark Chocolate – shoot for at least 70% cocoa powder. Melt the chocolate in the microwave until it is spoonable. Use 30 second intervals, stirring every time. It usually takes 2-3 intervals for a small batch. I generally opt for this method for a small batch over a stove-top method, which is another option. Add blueberries to the chocolate and gently stir until they are completely coated with chocolate. Spoon out 4-5 blueberries in a cluster and drop the cluster on a piece of parchment or wax paper. This recipe makes about 6-7 clusters. But, please…don’t hate me if you end up with less! The yield depends entirely on how many blueberries are in a cluster, the size of the blueberries and how thick the blueberries are coated with chocolate. Alternative presentation: For single berries, use a toothpick to dip each berry in chocolate! Dust the tops with finely chopped almonds. Place them in the refrigerator to set for about 30 minutes. 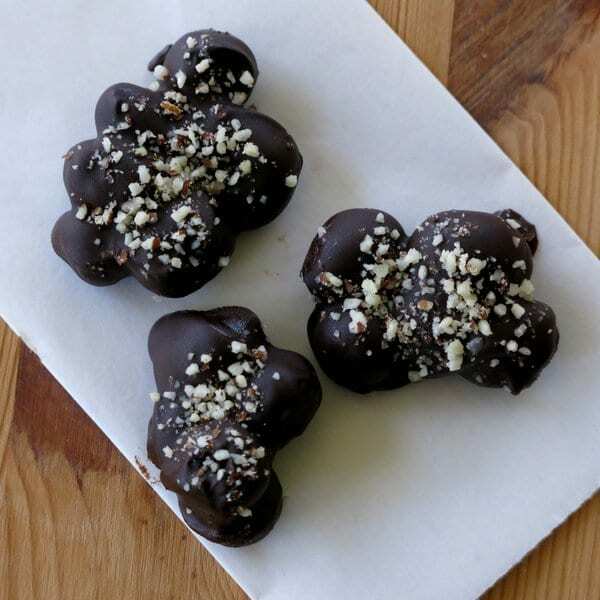 Chocolate covered blueberry clusters or individual berries can be frozen. Place the berries on a baking sheet covered with wax or parchment paper. Put the baking sheet in the freezer and allow the berries to set for about an hour. After that, the berries can be transferred to a freeze bag or freezer-safe container. When you are ready to enjoy one, lift it out of the freezer and allow it to defrost for about 5 minutes. Please rate the recipe below and [email protected] on social media. We love to see what you are cooking up! 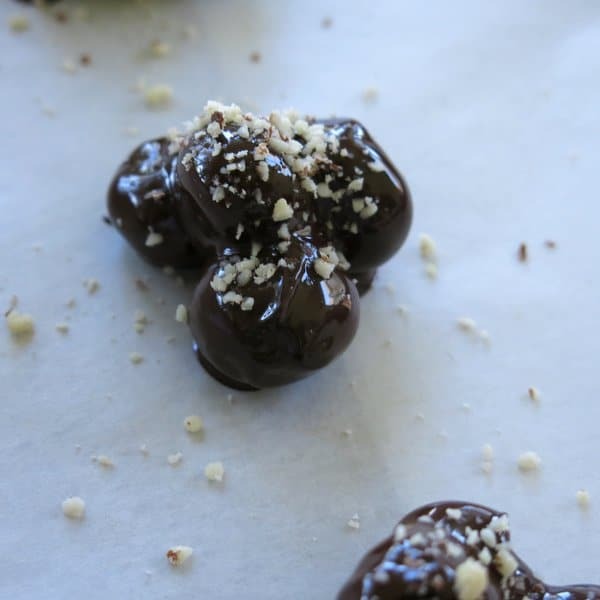 Dark chocolate covered blueberries are dusted with finely chopped almonds in this easy recipe that looks and tastes decadent, but uses healthy, real food ingredients. Melt chocolate squares in the microwave for about 30 seconds or until chocolate is completely melted and spoons out easily. Heat and check at 30 second intervals after that, if necessary. Add blueberries to the melted chocolate and gently stir. Use a spoon to lift out 4-5 blueberries at a time in a cluster, allowing excess chocolate to drip back into the bowl. Place blueberry cluster on a plate or small baking sheet lined with parchment or wax paper. Sprinkle almond dust on top of the blueberry clusters. 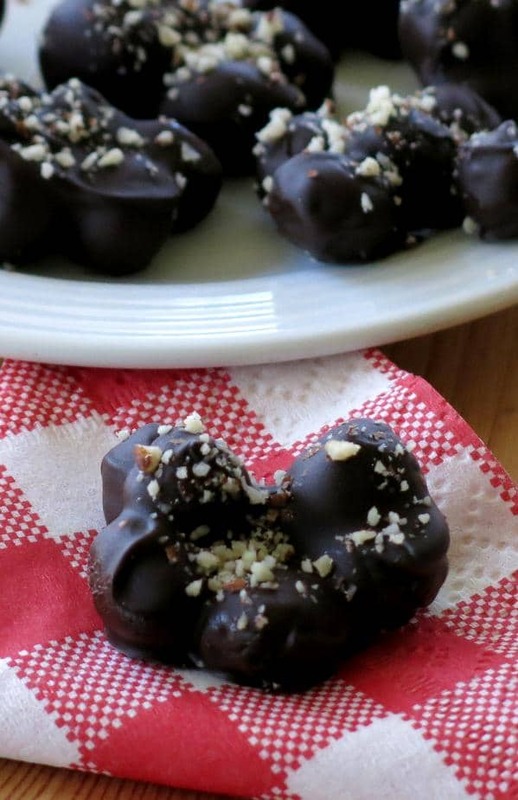 Place blueberry clusters in the refrigerator for at least 30 minutes or until chocolate has hardened. Remove from refrigerator when ready to enjoy! Store in an airtight container in the refrigerator for up to 5 days depending upon the freshness of the berries. Or, store in the freezer. These sound so good. Chocolate covered fruit counts as a portion of fruit right? I have recently started a food sharing photo site and would love to have you contribute. What a nice little after dinner treat! I don’t believe I’ve ever had blueberries and chocolate together but it surely sounds good. This is such a fun idea! Looks so yummy! These will be a delicious addition for our Fourth of July celebration! Thank you! I love dark chocolate and blueberries!! 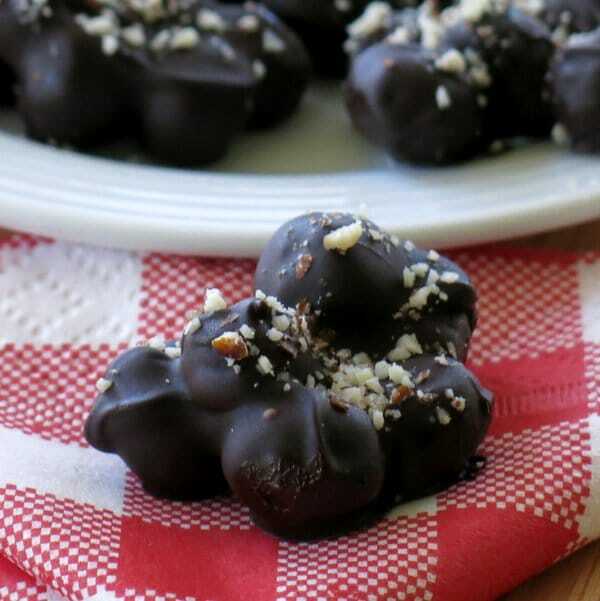 I have a bag of store bought ones in the freezer for snacks but I’d love to make my own! Totally saving this! YUM! My husband eats a lot of nuts and dark chocolate, and so I think combining them with blueberries would be perfect for him! Such a tasty snack that you can feel good about indulging in! You can’t beat fruit, nuts and chocolate! What a perfect dark chocolate fix!